How to remove black bars from existing YouTube videos? Remove black bars automatically from the video shot by any devices. Frame overlays for decorating black bars in portrait videos. The black bars appear because the video uploaded by the users may include horizontal black bars at the bottom and top of the video player to fit an aspect ratio of 4:3. The YouTube video player has an aspect ratio of 16:9, so it adds vertical black bars to fit according to the dimension. 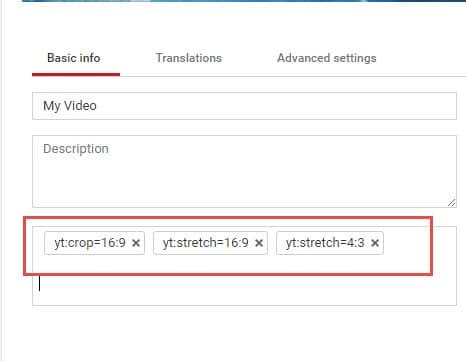 And in this guide, we will help you get rid of this trouble and remove annoying black bars from YouTube videos. You can make use of the following software to remove the black bars from your videos. Import the video or drag and drop it in Wondershare Flimora. Select the video with black bars and right click on it. Click on "crop and zoom" which will open the crop window. Set your desired frameset (16:9, 4:3 or customized aspect ratio) and see your video in the preview pane. Save the new video without the black bars by clicking on "Export". You will see the video in preview and a timeline beneath, right click on the video clip on the timeline. Click on properties, a new window will pop-up, click on disable resample and make sure that "maintain aspect ratio" is unchecked. Your video will be without the black bars. Save the video. This inbuilt tool in Windows for video editing can be used to remove the black bars from your YouTube videos. Drop and drag the video to windows live movie maker. Select the video and you will see a couple of options to set aspect ratio. Click on the desired one and the black bars will be removed. You can save the video in different formats. Import the video with black bars. Select the video and change its aspect ratio. (Either stretch it or crop it). Save the video after it has been corrected. This tag zooms in on the video because of which the contents at the borders (black bars in this case) do not appear anymore. This tag stretches the video in the aspect ratio of 16:9. It is used to view the video in wide-screen format. if your video is appearing in wide-screen format, but you want it to display in 720 x 480 pixels, apply this tag. It scales down the video 4:3 aspect. Try any of the above software to remove black bars from existing YouTube videos or the new videos and make it pleasant to viewers. How to Add YouTube Annotations and Cards? It doesn't work for movies uploaded after June 2016. YT dropped support for these tags. hi hoe are you? i tried: yt:stretch=4:3 yt:stretch=16:9 yt:crop=16:9 nothing works... do u know why?